Your retail return policy can have a significant effect on your customer satisfaction and your store's profitability. A policy that's too strict can make customers reluctant to shop with you; a policy that's too lenient can cut into your margins and encourage return fraud. To strike a balance that keeps both your bank account and your customers happy, consider these factors when developing your retail return policy. State laws: Before you set your policies, visit your state government website, or contact your state government to learn any laws that regulate retail returns in your area. Return window: How much time will you give customers to return products? If customers return products months after purchasing them, you may get stuck with out-of-season merchandise you can't resell. Common return windows are 30 to 90 days; the shorter time limits are best for trendier products that become obsolete quickly. Another option: Give a full refund within 30 days, then reduce the amount refunded by 10-20 percent in 30-day increments. Receipts: Generally, retailers require receipts in order to return merchandise for a full refund. However, you can eliminate this step (and reduce return fraud) with a point-of-sale system that integrates with your inventory and customer data, enabling you to look up transactions in your database. This is also a useful tool for tracking customers with unusually high return rates or products that are frequently returned. Refund method: Decide whether returns will be credited in the original form of payment or store credit. In general, it's best not to give cash unless the original purchase was made with cash. Will you charge any restocking fees, such as for costly electronics or opened products? 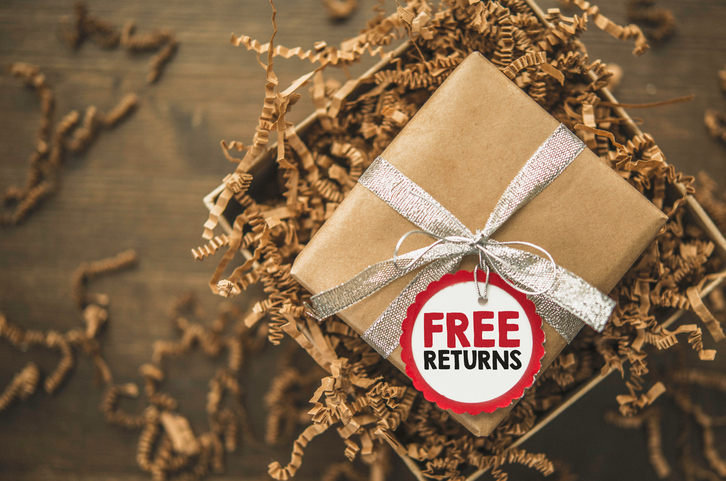 Gift returns: Even if you gave the original purchaser a gift receipt, the recipient who is returning the item may not have the receipt with them. If you allow gift returns without a receipt, protect yourself by offering store credit only, not cash. Exceptions: Every return policy will have some exceptions. For example, clearance merchandise may be final sale. You may also have different policies for certain types of products, such as electronics or formalwear. You may also adjust your return policies during the holiday shopping season — either making them more lenient so customers can buy gifts with confidence, or more restrictive to reduce return fraud, which often soars right after the holidays. Educating your staff and customers on your return policy is key to its success. Train all your salespeople in accepting returns so they can make the process as painless as possible for customers. Create a step-by-step cheat sheet for both returns and exchanges, and keep it near your point of sale. To educate customers, post your return policies where they are clearly visible near your point-of-sale and on your business website. Reinforce the information by printing your return policies on your receipts and having salespeople verbally confirm return policies, such as, "Just so you know, all clearance items are final sale," or "You can return this within 30 days as long as you have the receipt.” The more customers know about your return policies, the fewer arguments and dissatisfied customers you'll have. A good return policy will discourage fraudulent returns, minimize all returns and ensure the returns that do take place go smoothly for you, your employees and your customers.